Hearts defender Ben Garuccio will be absent for at least 10 months after tearing his cruciate knee ligament. Manager Craig Levein said the left-back's "foot caught in the turf and twisted" during training this week. 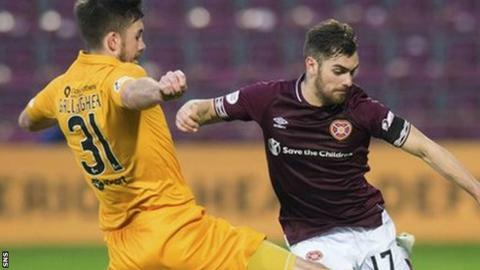 The 23-year-old Australian has played 23 times for the Tynecastle side this season and is the latest of several long-term injuries at Hearts. Christophe Berra, John Souttar, Michael Smith, Uche Ikpeazu and Steven Naismith have all had long absences this term. Levein confirmed that Smith is still not ready to make his return after tearing a thigh muscle in January and that another defender, Clevid Dikamona, has not trained this week because of a knee problem. Fifth-placed Heart of Midlothian face Aberdeen on Saturday, with three games remaining until the Scottish Premiership splits.